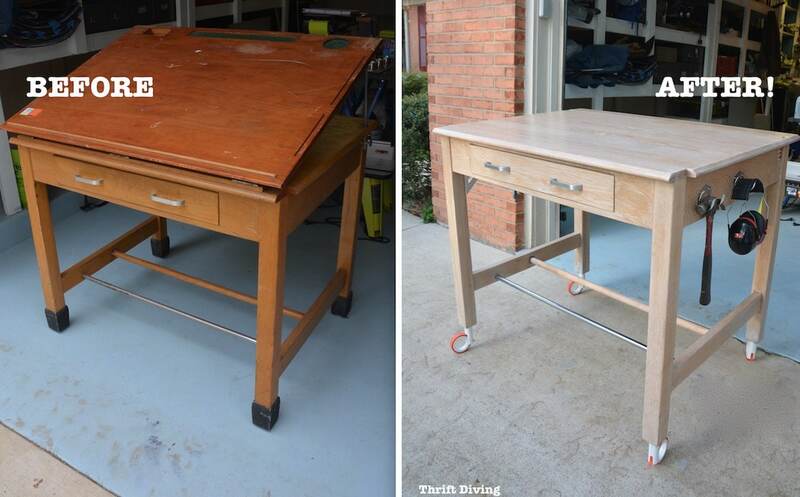 Long before crazy do-it-yourselfers like me came along with paint brushes in hand to paint over wood–GASP!– furniture stripping with chemicals (such as Citristrip) and other furniture strippers helped people bring old furniture and wood back to life. But not long ago, painted furniture became wildly popular and even ya girl (ahem–I’ll admit it) slapped paint on nearly every piece of thrifted wood furniture I rescued and lugged home. It was fun! And it’s still fun to paint furniture. 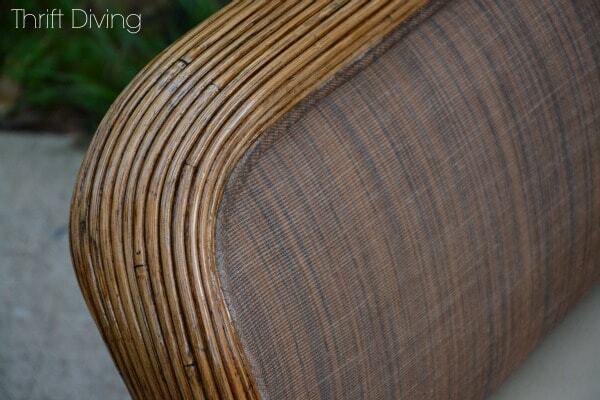 There’s nothing like seeing an old beat-up piece of furniture get a fresh new look. Over the years, though, if you haven’t noticed, there’s been an emergence of wood furniture again, although it still looks weathered and trendy–not like your grandma’s old stuff from 1956. Instead, if it’s in bad shape, I almost welcome the challenge of a good furniture stripping project! 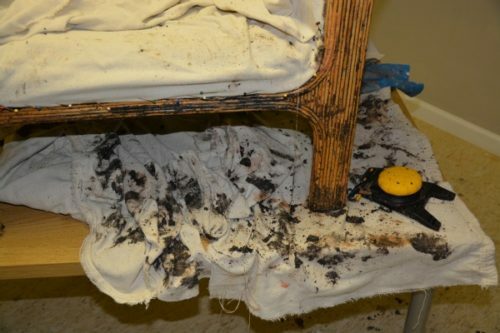 You might want to strip furniture, too, but you’re not sure how to strip furniture, and you’re not even sure if you have to use chemicals like Citristrip or if you can just break out the sander and get the job done. 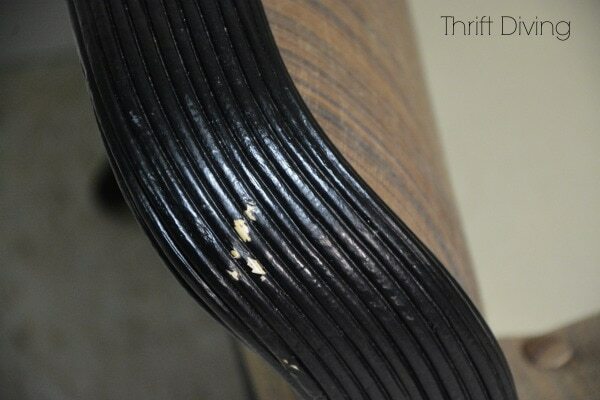 Before we jump into the how of stripping furniture, let’s talk about when to strip furniture. I bet you never even considered this question before, have you? We get so caught up in how to do it that we forget that not every piece of wood furniture needs to be stripped. It’s previously painted. This is pretty obvious. 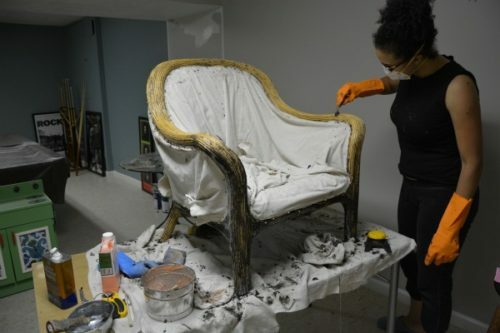 If you want to restore a piece of furniture back to its original wood stain or to go natural on the furniture, and it’s painted, you’ll definitely need to strip away the paint with a chemical stripper. (WARNING: Please read this safety article about the dangers of certain chemical strippers that are dangerous and have lead to a couple of young men’s deaths due to a chemical in certain strippers called methylene chloride). It’s really scratched or beat up. If you want to restore the wood but it’s pretty beat up, then stripping is a great idea. There are lots of nooks and crannies. 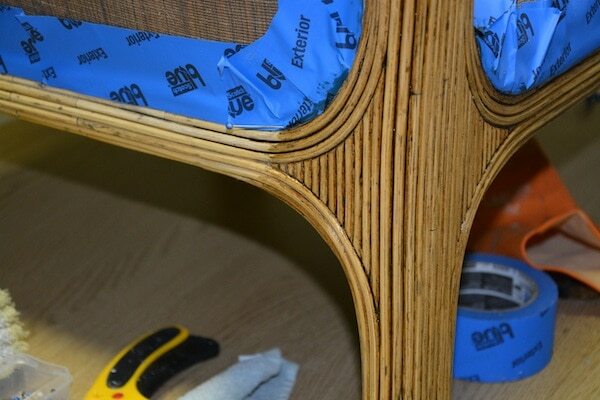 It would be hard to sand off all the existing finish of something with lots of nooks and crannies. 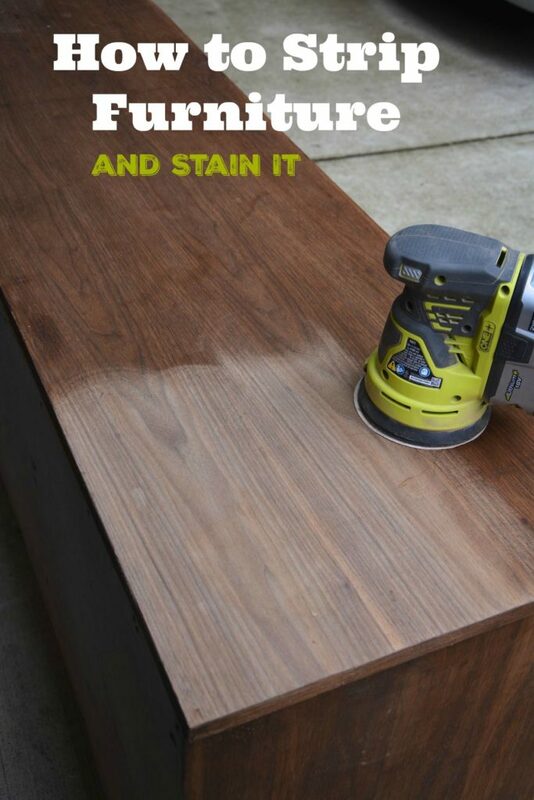 Use chemical stripper for those pieces of detailed furniture. You’ve only got dents. Instead, check out videos on YouTube on how to remove dents from wood with steam and an iron! Pretty cool! It needs a lot of wood filler. If your furniture has a bunch of cracks, chips, or gouges that require wood filler, it will be hard to disguise all that wood filler under a coat of stain. Wood filler, despite being “stainable” never blends in very well with wood. 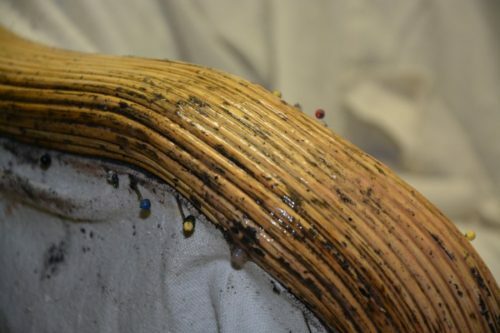 If your piece needs a bunch of wood filler to repair it, go ahead and use the wood filler, but plan on painting the furniture instead of re-staining it. The paint will hide the filler. You’re planning to paint the furniture. You don’t have to strip furniture before painting it. You want to change the furniture from light wood to dark wood and it’s in pretty good condition otherwise. Can you strip furniture by sanding? 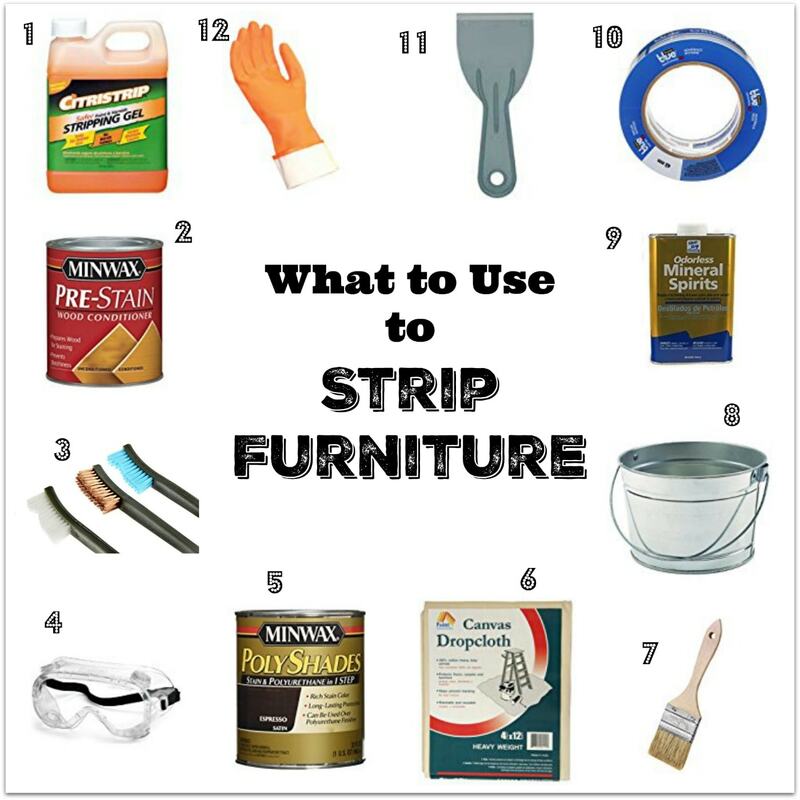 Well, if you’ve never stripped furniture before, you may be wondering how easy it is to strip furniture without chemicals, or thinking that chemical strippers are the only option for removing the existing finish. 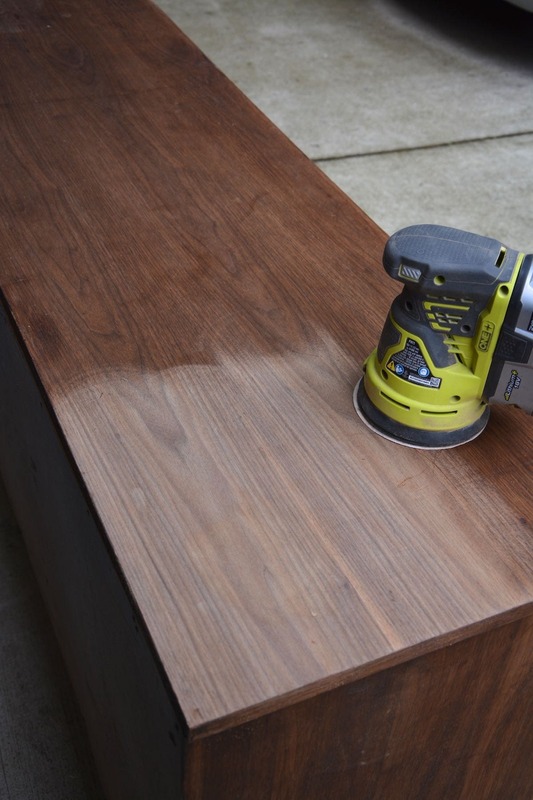 You can, in fact, simply use an orbital sander to strip furniture, especially on wood. In the case of this mid-century modern dresser makeover, I did use a chemical stripper and then followed with an orbital sander in order to remove the last bit of remaining old stain. However, I have refinished several dressers where I simply sanded the top down or the body and skipped the chemical strippers. Sometimes it was just a matter of not feeling like pulling out the chemical strippers. The key to getting good results when sanding wood with an orbital sander is to make sure you’re moving slllloooowww, like 1 inch per second. 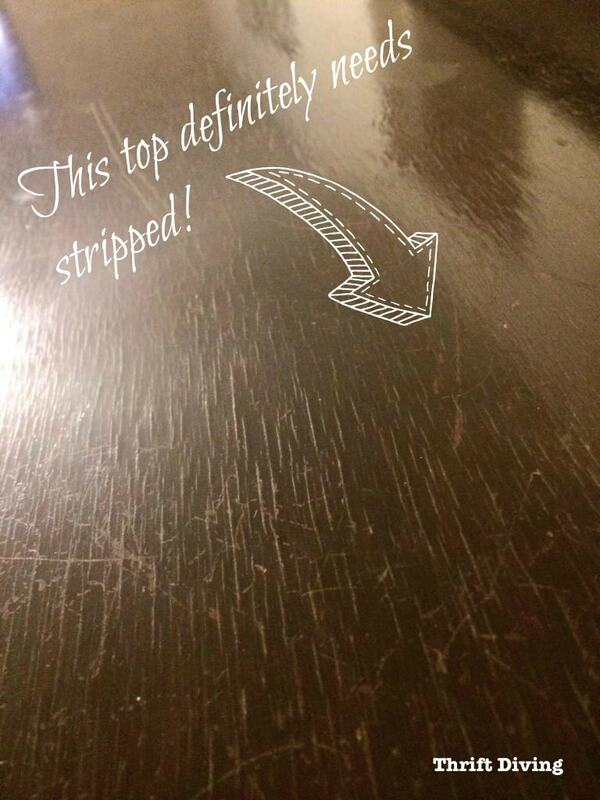 Any faster and you risk ruining your wood surface with those swirly marks otherwise knowns as “pigtails.” Many times you won’t see them until you go to add stain and then–SHOOT!–there they are–all over your gorgeous “new” stripped top! If you go slow, you’ll get beautiful results! When you’re stripping large, flat surfaces. However, if you’ve got curves or nooks and crannies, go with the chemical strippers which can get into those nooks and crannies. Use the bristled brushes on the nooks and crannies. When you’re totally intimidated by chemical strippers and you’d rather just stick to something you know: orbital sanders! When it’s only a small area and you can knock it out quickly with a sander. You prefer to strip furniture without chemicals. Work your way down from a rough grit sandpaper such as a P80-grit “rough” grit…..to a P150-grit “medium” grit…and at times, you may finish with the P220 “very fine” grit, although you may not need it. 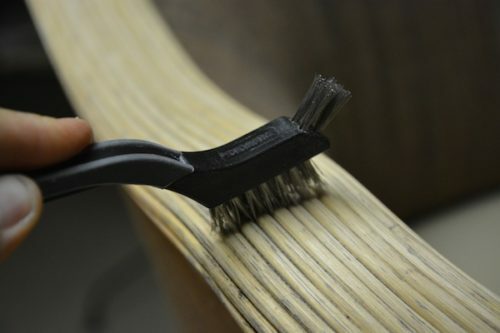 Do your final sanding by hand to remove any last little bit of swirly marks. You could potentially sand waaaayy too far down on the wood and end up with a discolored spot that won’t take stain well. Thankfully, I got creative with it and disguised my boo-boo as a pretty little stenciled flower. LOL. But you may not be so lucky to have your boo-boo land in the right spot for that! I’m sure there are many options on the market, but there are two that I’m familiar with. And honestly, they both work pretty well. Let me introduce you to Citristrip and Blue Bear. (WARNING: Please don’t use chemical strippers that contain methylene chloride, such as brands like Klean Strip, Goof-Off, Strypeeze, Jasco, among others. Read this article on the dangers of those strippers with methylene chloride). Can be left up to 24 hours and will stay wet. Smells strong, despite the claim that it can be used indoors. I wouldn’t want to use it indoors because it still smells, but it’s not as harsh-smelling as other strippers. It’s easily found at many home improvement centers and online. But another stripping gel that I’ve come to love and use for many projects is Blue Bear Paint & Urethane Stripper. It has virtually no odor! This stripping gel, I would definitely recommend using indoors. It’s only found at specialty stores like Wood Craft and other woodworking stores, or online. You can’t find it at your local big box home improvement store. My preference is the Blue Bear simply because it doesn’t smell. I find Citristrip too sweet-smelling but yet, still smells like stripping gel. Blue Bear, on the other hand, is virtually odorless! So to strip furniture, you obviously need some supplies, one of which I just covered: stripping gel. But what about all the other tools and materials needed? (NOTE: I am a participant in the Amazon Services LLC Associates Program, an affiliate advertising program designed to provide a means for us to earn fees by linking to Amazon.com and affiliated sites). #2 – MinWax Pre-Stain – Prevents blotchiness in soft or porous woods. Watch this important video for a demo of Pre-Stain. #5 – MinWax PolyShades or another stain. 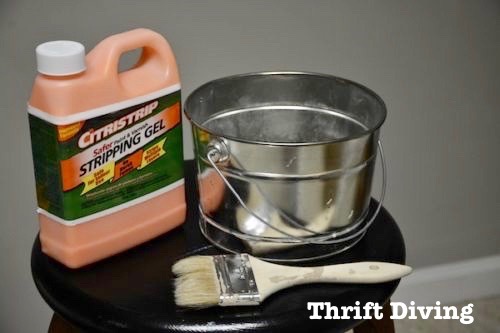 #9 – Odorless Mineral spirits (or After Wash) – Help to clean the stripping gel residue off. #12 – Chemical-resistant gloves – Don’t use regular gloves that you’d use to do a medical examination, LOL. Get gloves specifically labeled as chemical-resistant gloves. 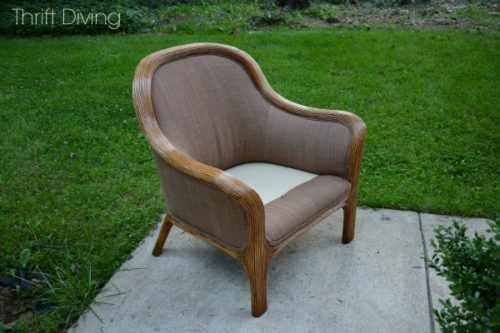 The project I’m sharing with you is a pretty chair that a friend asked me to strip for her. She and her daughter mistakenly painted it with a bad Rustoleum paint that left the palm wood in horrible condition. You can’t just strip furniture in just any ‘ole place in your house. It’s a dirty job. Even with a drop cloth, I guarantee you’ll have a mess everywhere. Choose a place where it’s okay to dirty up. Garages are best. Basements also work well, as long as it’s not carpeted. For those of you that live in apartments, maybe you’ve got a balcony. Make sure the space is ventilated. Again, no matter how environmentally friendly some of these chemicals claim to be, their still chemicals that can make you feel yucky if you breathe them for too long. Use a fan to circulate the air, too. 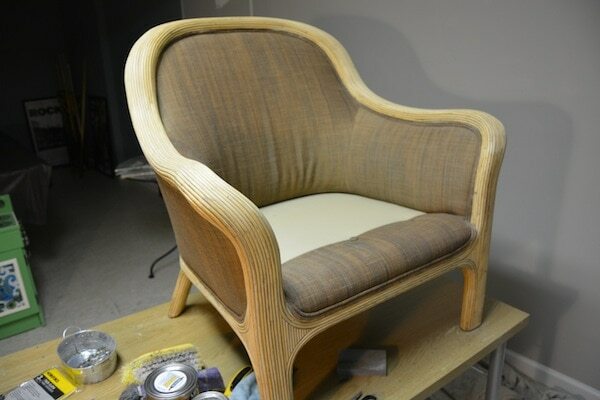 Some pieces of furniture are upholstered, too, which can be super challenging. Be sure to cover the exposed areas so you don’t drop gunk on it. 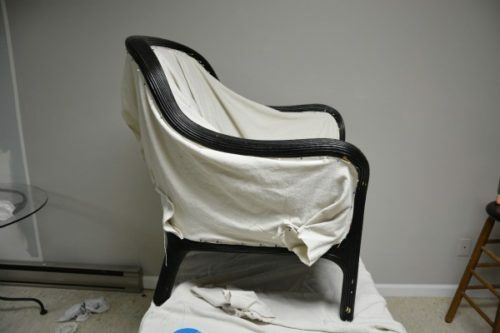 I used a drop cloth to cover the upholstery, held in place with straight pins. 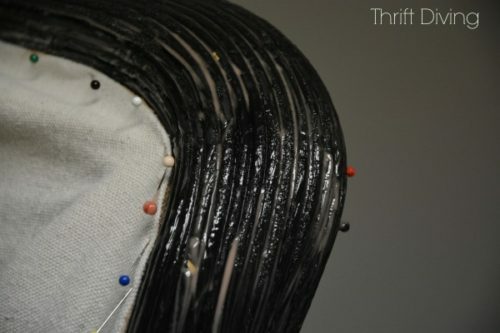 If your piece has any fabric, try this method. It worked well for me. 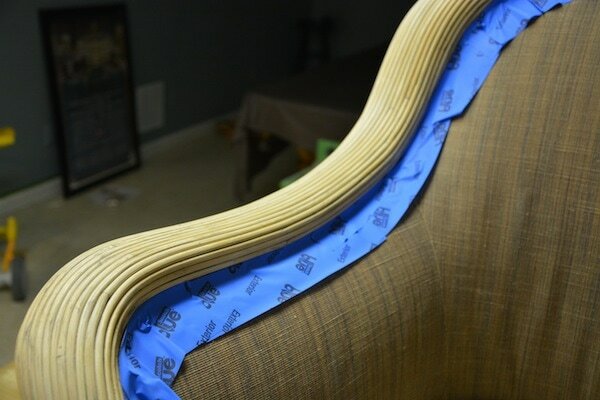 I also later used interior/exterior painter’s tape to protect the upholstery when I was staining. 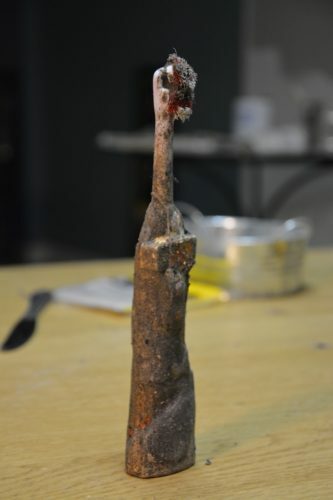 If there are any handles, knobs, hinges on your piece, remove it all. Don’t take the lazy route and try to just go around them. Remove everything. You’ll save yourself time by not having to fix stupid mistakes. Step 4: Fill a Tin Bucket with Citristrip. Now that you’ve gotten all your tools and your piece is prepped and ready, add some Citristrip to one of the tin cans. First, however, don your mask (if needed) and your chemically-resistant gloves, eye protection, and mask. It may smell “good” like citrus, but it still makes you feel yucky if you breathe too much of it in. Step 5: Apply the Stripper. Using your old paintbrush, coat each section liberally, but don’t totally saturate it so it’s coming off in globs. You’ll start to see it work immediately, but don’t try to scrape away the gunk immediately. Let it work for a good 30 minutes. The old paint or old stain will slide off like butter. The cool thing is that Citristrip stays wet for up to 24 hours, so by all means, if you need to, slather it on before you go to bed, and work on it the next day! Just make sure that it’s somewhere where kids and/or pets won’t bother it. Be sure not to miss any areas, or else you’ll find yourself having to go back over it like some people did <<raising my hand>>. Step 6: Scrape Off the Old Paint, Varnish, or Stain. Like mentioned above, use a plastic putty knife. 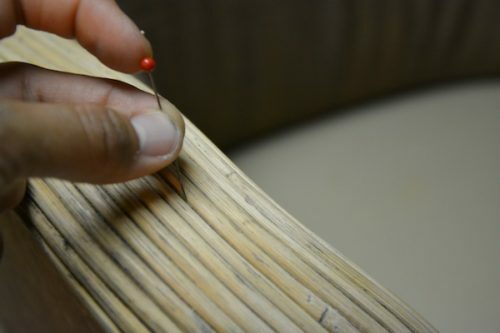 The metal knife may gouge your wood. Then you’ll be researching “How to Repair Wood Furniture” because of all the nicks! But if all you have is a metal putty knife, run the sharp edges over the sidewalk or a piece of rough sandpaper in order to round it out and dull it. That is less likely to gouge your wooden furniture. 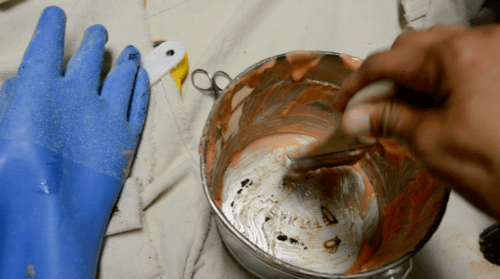 This is where another tin bucket comes in handy (and the drop cloth!). You’ll scrape off so much nastiness that you will need a place remove it from your scraper. Step 8: Apply a Second Coat of Stripper. Use an old cloth to wipe away the leftover stripper and residue. You probably did forget a couple areas. Or some areas were stubborn. It’s okay to apply more stripper to the stubborn areas. I had to apply more paint stripper in several places. Now’s the time to do it, after most of the other stuff has come off. Step 9: Use Mineral Spirits to Loosen the Rest and to Remove Residue. After stripping furniture, you’ll need something to help loosen the residue from the surface, and mineral spirits (the odorless one) will help you do it. You can also use After Wash. Put some in a tin bucket. Now use your bristled brush (if it’s a small area, or use a larger brush on a larger piece of furniture) and just go over each section. Wipe away the excess mineral spirits or after wash. Step 10: Sand Down the Wood. Typically when stripping furniture, after you’ve removed the old paint, stain, or varnish, your wood will still be slightly stained. Sanding helps to remove that residual staining, but you may not be able to sand it down to a perfectly raw wood finish. Sanding also helps to smooth out the wood and creates an abrasive surface upon which the pigment in the stain will lie. Use a P150 “medium” grit sandpaper. Use a tack cloth to remove the leftover sanding grit. You don’t want that ending up in your stain and varnish. Now that the old stain or paint is off, it’s time to stain your furniture. I have to admit, I love staining! Seeing the rich color come alive back into wood that looked pretty awful is very rewarding. Plus, stain just lasts longer than paint. 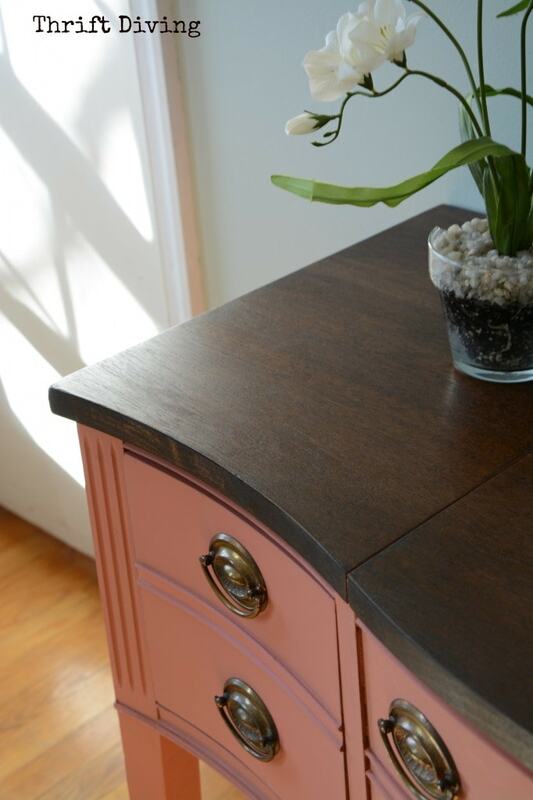 I don’t think I have ever painted any piece of furniture that hasn’t started to wear thin in highly used areas–even with a couple coats of clear topcoat or wax. But with stain, that stuff is tough and it takes a lot to get it looking worn. 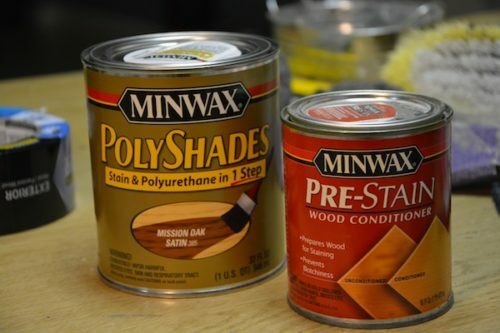 Personally, I love the Polyshades by Minwax, because it has the poly with the stain in one “go.” It’s just easier to use. If you need to change out your protective cloth, go right ahead. Mine was so nasty that there was no way I could stain with all the debris so close to the finish. So I removed it. 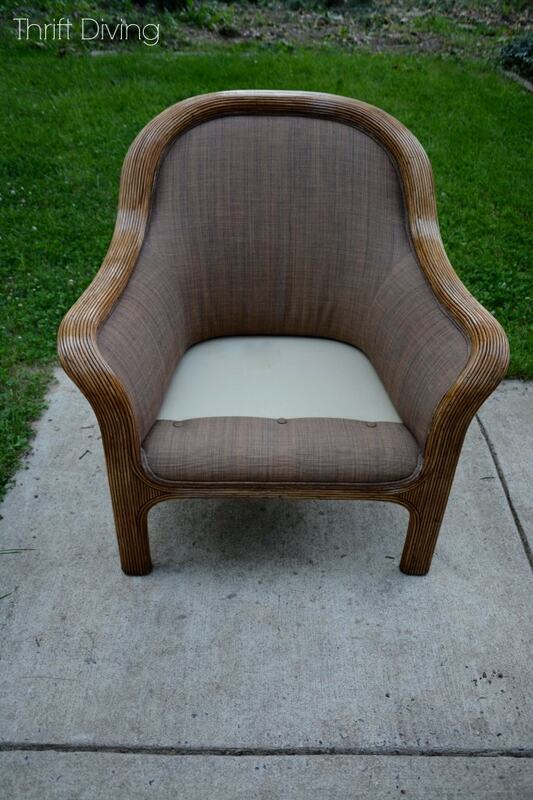 Look how fresh and pretty that chair looks in its natural state! 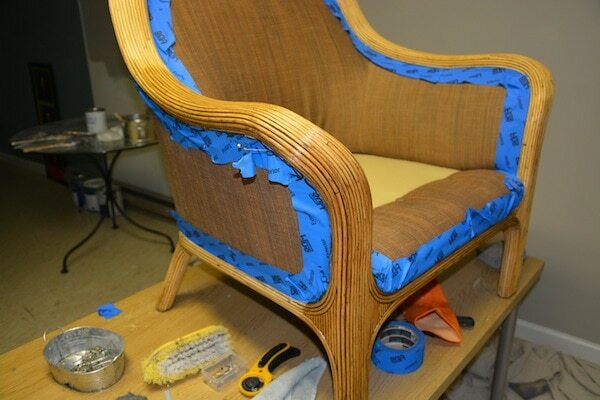 Next, tape off areas that you don’t want to stain to get on, especially when you’re staining furniture with upholstery. I used interior/exterior blue painter’s tape I mentioned above. It held better and was tougher all around. I highly recommend it for projects around the house where you need a good seal. Whenever you’re staining raw wood, as I mentioned above, it’s always a good idea to pre-treat it with pre-stain (see “Materials” above). It helps condition the wood so that the stain evenly soaks in and doesn’t turn out blotchy. If you’re not sure why you would need to use pre-stain on your pine, fir, and other soft or porous woods, just watch this quick clip. STEP 2: Apply a Coat of Stain. Apply a coat of stain to your furniture and then wipe it off. I wiped it off after a few moments. I loved how the stain is a little thicker than regular stain and it settled into the grooves like glazing. Use Fine grit sandpaper (such as P220) and sand lightly after the first coat has dried. 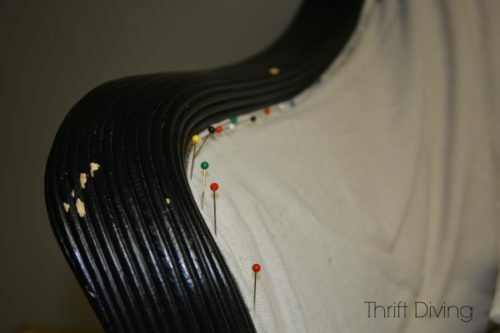 Use a tack cloth to remove the sanding dust. STEP 4: Apply a Second Coat of Stain or Polyshades. Typically, the pigment stains, they sit on the top of a surface; they don’t actually soak in. Adding another coat likely won’t deepen the color too much, but one more coat won’t hurt. Don’t go for perfection if this is your first furniture stripping. It’s never going to look perfect! My first staining project of my dining room table was a nightmare, and I felt horrible that it didn’t turn out as I had expected it to. I eventually just had to accept it the way it was, and I ended up LOVING it. But no staining job is going to look perfect when you’re starting out. Cut yourself some slack! STEP 6: Celebrate Your Accomplishment! After cleaning everything up (use mineral spirits to help clean up spilled bits of stain), give yourself a pat on the pack! Take tons of “AFTER” pics to show off to your friends and family (and to yourself, because you won’t believe how different your piece of furniture looks). Did you find this guide helpful? 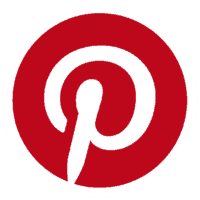 If so, click here to SAVE it on Pinterest! 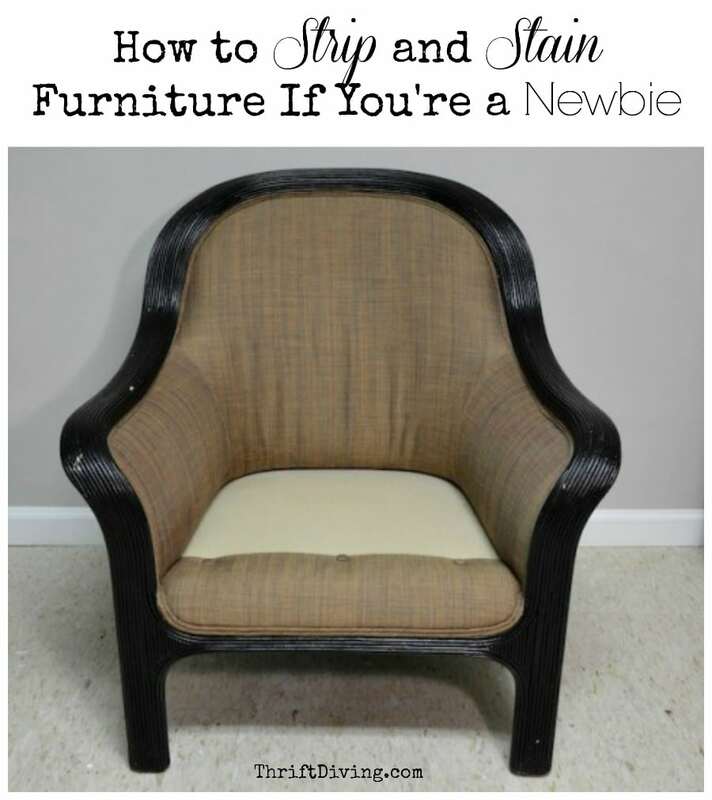 I hope that this blog post and the YouTube tutorials of how to strip furniture and stain wood furniture gives you a starting point for tackling a furniture stripping and staining project! 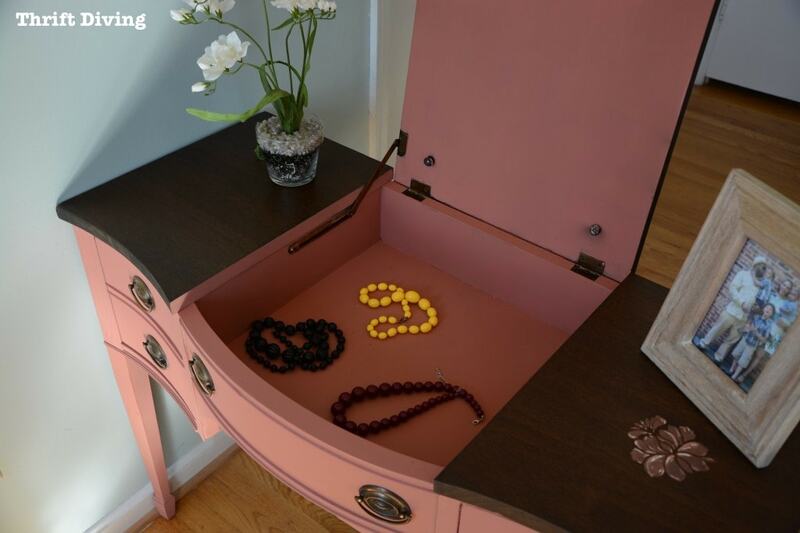 It’s scary if you’ve never done it before, but the possibilities of beautiful furniture are endless! Have you ever stripped furniture before? How did it turn out? If you have any tips, leave your tip below and add to the conversation! The article is great! I tried Minwax stains many times, they are really good. But now I’m looking for something new, maybe I will find an outstanding stain for my needs you know. Have you heard about General Finishes stains? Many articles on the internet say those are great products. This article https://woodimprove.com/best-wood-stains really inspired me to try their stains. Have you tried those? Are they really that good? Thanks. I am ready to buy a sander, can you please give me a suggestion on what is best, also for tight spaces. I got some incredible pine and leather chairs and they don’t match my table, which is a dark walnut color. I am terrified that I am going to ruin the leather on the backs and seat cushions. 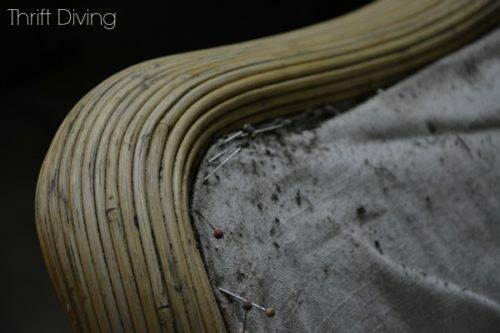 I am wondering how your upholstery held up with just the pins. Do you recommend adding painter’s tape and then the pinned dropcloth in such a situation? 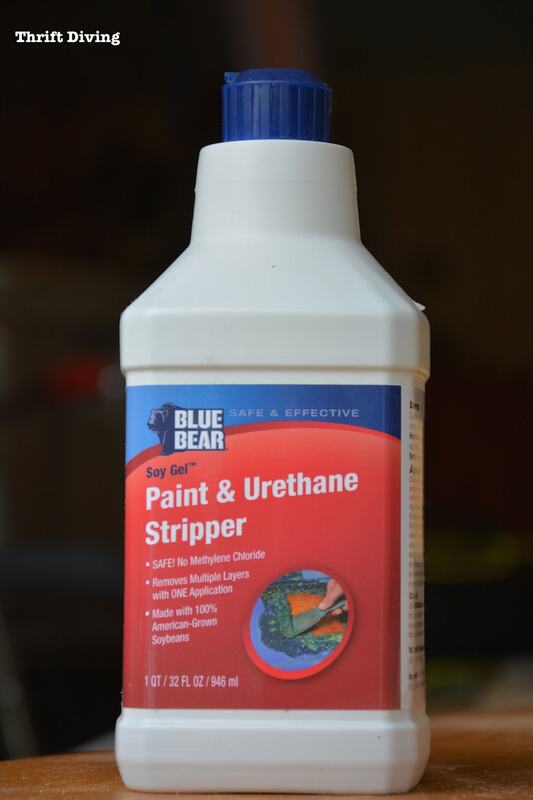 Also, how well would you say the Blue Bear works on stained & varnished surfaces? Is the citrus one better, or is there much of a difference? (I’ll be using my garage). I am agreed with you. I prefer staining over painting so am always happy to learn anything I can about the process I think the reason people paint every single piece of wood is that they don’t know much about wood. Thanks for all the info and keep up the good work. I really enjoy reading your blog. That’s exactly what it is–lack of knowledge about wood. Knowing what I know now, I’m more hesitant to paint good wood! Are Polyshades “the pigment stains that just sit on top, they don’t actually soak in”? I bought a table and the stain started peeling, leaving raw wood underneath. I don’t want to ever make the mistake of buying that kind! I was not a happy camper. Thank you for your helpful info on stripping wood. Great information, as usual! For the most part, I prefer staining over painting so am always happy to learn anything I can about the process. You haven’t heard much from me lately because I’m experiencing some health issues and haven’t been doing much. I still get just as enthusiastic about your posts, though, and read them all whether I comment or not. Great work; keep it up! It’s so nice to see someone refinishing furniture instead of painting it. I’ve painted a few pieces but prefer finished wood which has its own beauty. And that chair is simply gorgeous! Can’t wait for winter to end so I can get back into the garage and start another project. A friend gave me an Eastlake side table that is walnut. Why would anyone want to paint walnut? A bit of a challenge but once finished will be beautiful. Thanks for all the info and keep up the good work. I really enjoy reading your blog. Not just informational but entertaining too! Hi, Barb! I agree with you–walnut is beautiful! I think the reason people paint every single piece of wood is that they don’t know much about wood. I know that was the case for me. But after learning about wood and seeing the beauty of it, I’m less likely to just paint something. I like the idea of stripping and bringing something back to life, too! 🙂 Great to hear from you, Barb! 🙂 Thanks for the compliments about my blog! I really appreciate that!